This book was first published in 1935 and has remained in print ever since. In this hard-boiled, classic American novel, the protagonist, Robert, meets Gloria, a passionate woman with a sense of the dramatic. Both characters dream of getting into the movies but when they meet they’re both at a lose end, Gloria suggests that they enter a marathon dance competition. Which was a real and popular form of entertainment during the American Great Depression; couples would receive free food and a bed for as long as they could keep dancing. Couples often danced almost non-stop for hundreds of hours (as long as a month or two), competing for prize money which they could only dream of as a wage for a normal job in the time period. In this novel the marathon dance lasts for over 800 hours, it is a brutal form of entertainment – the young and poor participants are humiliated in front of a celebrity-dotted crowd. The bosses make them take part in races, derbies and a public wedding in order to pull in the crowds. Horace McCoy was a bouncer at many of these dances in the 1920s, which is where he got the inspiration for the novel. This novel has been described as the first American existentialist novel, it is about the brutality of humanity, depression and suffering. No word is wasted in the book, McCoy delivers the story with brutal minimalism. Surrounding pools of beauty, like a a spot of sunshine that the protagonist dances in everyday of the marathon, with fist-fights, murders, crime, and pessimism. Each chapter starts with a snippet from the verdict at a murder trial, there are also glimpse to the impact of this trial though out the narrative, with the protagonist looking back with nostalgia at the days when he was happy – and at the days when Gloria was happy. Reading the title is all about putting emhasis on the right word and you won’t realise the full significance of it until you get to the very final line of the novel. 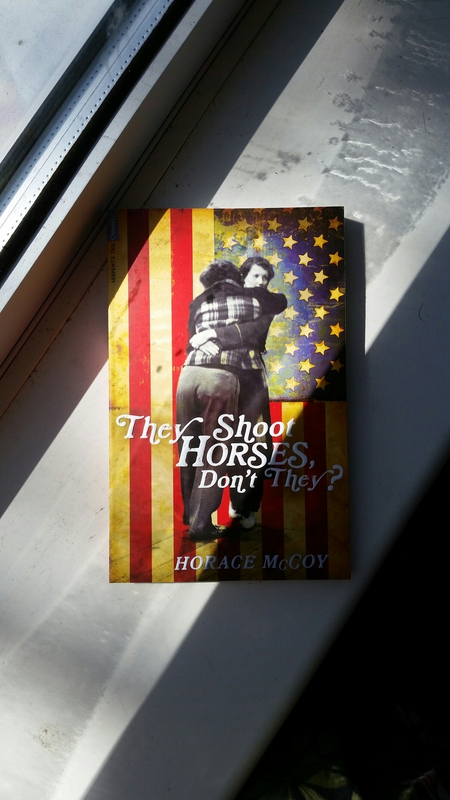 The title is a reference to mercy – it is kinder to shoot a horse with a broken leg than let it suffer. Every character in this novel is suffering in their own way, they all have nothing to lose at the marathon dance and a possible $1,000 to win.